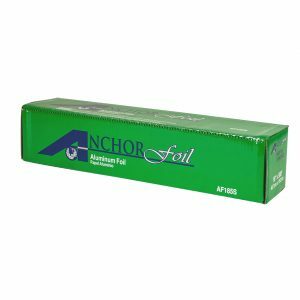 Home / Foil / Rolls / AnchorFoil ™18″ x 500′ Std. AnchorFoil cutter box rolls are available in standard and heavy gauge aluminum, in various sizes and lengths. Attractive "recycling green" cutter boxes are moisture and grease-resistant, and easier to clean than white cutter boxes. Safe cutting edge helps reduce workplace injury.